Last night, the Senate voted to proceed with the consideration of the transportation bill Majority Leader Mitch McConnell and Democrat Barbara Boxer had worked out. It was just a day after the body had voted to block progress, objecting that they hadn’t had time to even look at the bill. The policy elements of the bill are largely untouched from what we’ve already seen: the Environment and Public Works Committee’s DRIVE Act and the Commerce Committee’s section on rail and safety. Much of that was largely untouched from MAP-21. A threat to eliminate TIGER was eliminated. A new formula-based multi-modal freight program is included. Some good language on Complete Streets appears to be gone. Advocates will feel better when the transit section gets fleshed out, and the Banking Committee is still MIA. This bill just doesn’t include earth-shaking policy changes. But truly, the uproar over it has never been about policy. It’s all about funding. You know this because you haven’t been living under a rock for the last five years. Combined with expected gas tax revenue into the Highway Trust Fund, these offsets cover three years of what is still being called a six-year bill. That fulfills McConnell’s singular goal of getting rid of this issue until after the 2016 election. And it means we’re going to have to have this same annoying conversation again in three years. The provision eliminating Social Security benefits for fugitive felons was pulled after outcry from Democrats and the delightful Huffington Post headline, “Congress Can’t Write A Highway Bill Without Punching Poor People In The Face.” But there are plenty of offsets left on that list that are making people angry. 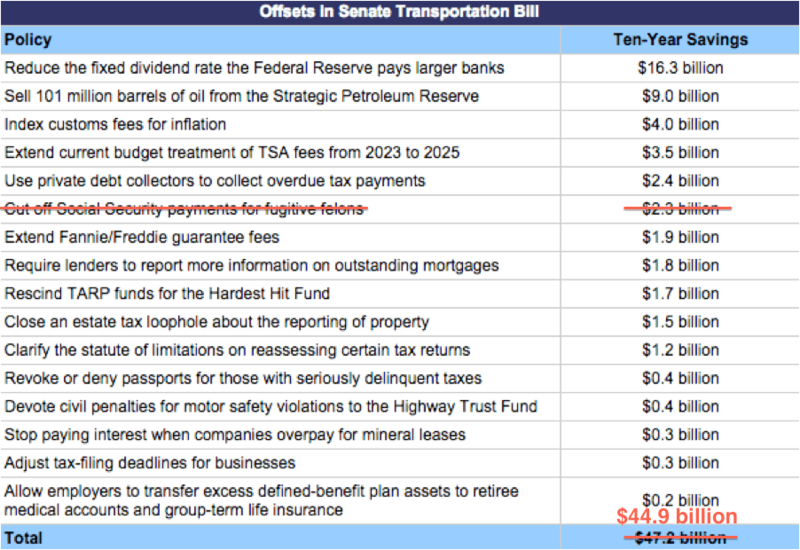 Not to mention, of course, that this bill is being funded by offsets and not fees related to transportation, as transportation bills (real bills, that is, not extensions) historically have been. Divisive issues like selling off Strategic Petroleum Reserve oil, diverting funds that should be used to protect people’s mortgages, privatizing tax collection, and cheating hard-hit neighborhoods out of federal support aren’t the only problems. Republican presidential hopefuls are trying to attach other contentious issues to the bill: cutting Planned Parenthood funding, cutting funding for Congressional employees’ Obamacare premiums, and more. And then there’s the issue of the Export-Import Bank reauthorization that’s been dragging this process down for weeks. So guess what, folks? This bill probably won’t pass. Even Boxer BFF Nancy Pelosi says she wants to just pass the five-month extension and give legislators time to write up a real bill. Five months is still not nearly enough time for Washington to grow up and raise taxes, though, so who knows what good that’ll do. Maybe they’ll find some more loose change and terrible ideas under the couch cushions. So, why is it that the discussion is always about raising revenue? What about cutting costs? Have you ever seen the paperwork that goes along with a federal aid project? There are reasons why they cost so much more than similar state- or municipally-funded transportation projects. There are two ways to cut red tape, but congress only knows how to cut it lengthwise. Cutting military costs would make a lot of sense, given that it’s something like a third of the budget and seems to be completely worthless (we keep losing every war we get involved in). But Congress won’t do that for some reason….